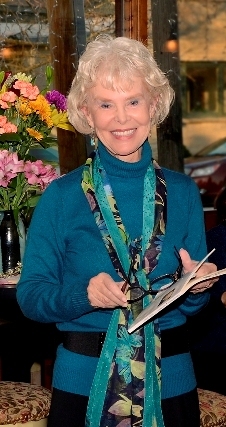 Three of MaryJo's poems published on THE POETRY STOREHOUSE site have been chosen by international filmmakers to create video remixes (on Vimeo). Each one is uniquely beautiful. She's thankful for the opportunity to have her poetry reach more people through the medium of film. Thank you to the talented filmmakers: Marie Craven, Othniel Smith, and Marc Neys. JOMP - Journal of Modern Poetry, Chicago, II. 1st place, "Fugue in C# Minor"
Poetry of the Sacred (one of four) - "Pilgrimage to Mont- Sainte-Victoire"
Winston Salem Writers 3rd place, "Behind the Curtain"
2010, Poetry, 2nd Place - "Building Blocks with my Grandson"
2010, Prose, 2nd Place - "Celebrating Dad"
2007 Best Woman's Poem, 1st Place - "At A Bar in Denver with My Son and His Friends, I Learned Something New"
2006 New Talent Poetry, 1st. Place - "Genesis"
2012 First Place, "Sugar Peas"
2012 Third Place, "Playing the Piano"
2011 Second Place, "For My Father at Ninety-Three"
2010 First Place, "The Gift"
2010 Third Place, "Under a Canopy of Golden Chestnut Leaves"
2007 Honorable Mention - "A New Metered Riff"
2012 First Place, Essay "Drawn From the Dark"
Honorable Mentions for "Abby and the Light" and "New Notes for an Old Love Song"
2011 Second Place - "Diamonds in the Dark"
2nd Place, "Tennessee Walking Horse" and "All That's Left to Say"
Editor's Choice, "The Space Between Us"
2011 Second Place - "Summertime"
2007 New Talent Award, 1st Place - "Abby and the Light"
2006 Triad Contest, Honorable Mention - "Sunset On Saylesville Pond"
2016 Jade Ring Contest, third place, "Sea Crows"
2012 Jade Ring Contest, 1st Place Essay, "When All Hell Broke Loose"
2009 Jade Ring Contest, 1st Place - "Bonnard Remembers Marthe in Evening Light"
2007 Jade Ring Contest, 3rd Place Prose/Nostalgia - "October at Dad's"
The Bard's Chair, 2009. 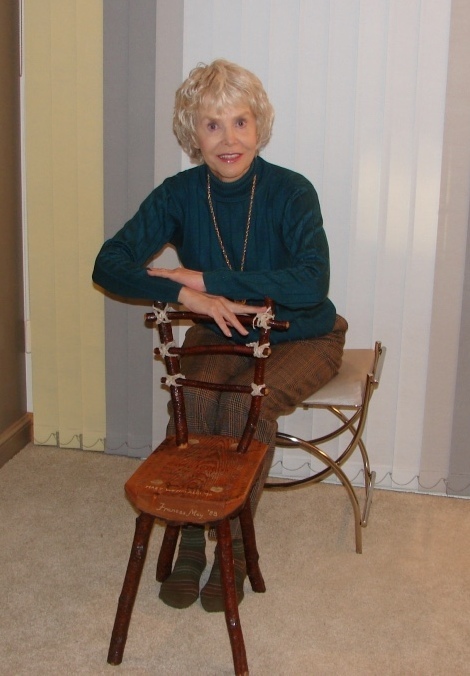 Mary Jo was honored with the chair and allowed to keep it for one year in placing first in the Wisconsin Writers Association Jade Ring Contest. 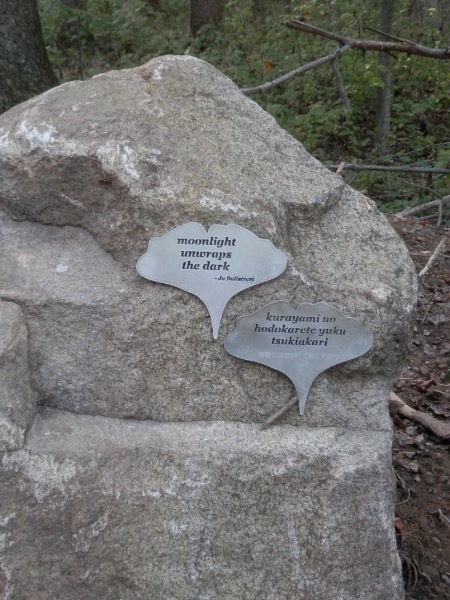 The stone is my haiku, chosen by a panel of three judges for the Midwest haiku path. Thirty poets in all are represented and each has a dedicated stone, their haiku inscribed on a metal plate attached to the stone in English and in Japanese. As the forested trail twists and turns, uphill and down, various aspects of nature are there to enjoy and/or meditate on as one walks the trail. The haiku path was the first installation for an open air art museum in Honey Run, Ohio. This collection of poetry is rooted in grief (the death of two of her grandsons from a rare genetic disease), but lifts its head to the sun, rather like the line drawing of a wildflower on the cover, proclaiming that its theme is joy, not mourning. Balistreri uses a quote from Psalm 30 to introduce the prologue: “Weeping may remain at night but rejoicing comes in the morning,” and there is an inclusive religious spirit throughout, embracing traditions as disparate as Zen Buddhism and Judaism. You can see this in some of her titles: “Meditation,” “Early Morning Blessing,” “Canticle to the Setting Sun.” Part I’s theme, how everything is connected, uses this quote: “The least movement is of importance to all nature. The entire ocean is affected by a pebble.” (Blaise Pascal) Part II contains ekphrastic poetry dealing not only with painting, but also with music. Part III is made up of poems about family. . .quiet, meditative poems told in a gentle lyrical voice, filled with luminous images and sparkling language. Balistreri is not afraid to be witty; in “The Visit,” the month of May “jots down items / in her blue-lined notebook,” then “pulls ten / yellow finches out of her bag. / Charmed, they puff into golden / globes.” If you know that the collective noun for goldfinches is “a charm of goldfinches,” then you can really appreciate the wordplay going on here. Her most vivid and memorable use of language comes in “Awakening”: “I love the way light spills from / the sky.” “The sky itself, shapeless, abstract / big Frankenthaler brush strokes that one could get lost / in.” The blue heron “standing in a shell of silence,” the dragonflies, with their “transparent wings,” “the wind-up / sanderlings that run a race with shirred tides, they way they / careen from water’s puckered stitch as sea meets sand,” are all examples of a writer who takes her time looking for les mots justes (just the right words) à la Flaubert. . . .
Elegy and desire infuse these finely-wrought poems by Mary Jo Balistreri, rising through loved landscapes and the art of Bonnard's ghostly figures, Hopper's lonely houses, Audubon's birds, the music of Mozart and Bach, as she tells of the loss of parents and grandsons, her own illness and healing. "I believe in grasshopper plagues, a murder of crows, conversations amoung the dead and the living," she writes, and we hear, in the arc of her memory, moving echoes of loss and love. In Gathering the Harvest, Balistreri sifts through the net of memory with all its losses - mother, two grandsons, her own cancer - to find pure gold. Poignant and heartbreaking ("he is six, and not yet crushed / by the cells collapsing inside him"), these poems steadfastly love this broken world where "a hawk kites / across the glass table. The gulf stretches out in silk." Throughout, Balistreri gathers a feast for the senses: "angel hair and roasted garlic, tomato-fresh sauce," "beds of daffodils, blazingstar,/ scarlet poppies," a Chopin prelude, "its light repetitive A flat, the memory raining / down into my open hands." O taste and see, dear reader, for there is much to admire in these courageous poems. Informed by close observation of the natural world and by art and music, these often haunting poems dwell "in the crevice between / longing and loss." Having lingered in such territory a long time, this articulate poet becomes our guide as she grapples with the facts of her own narrative. Through palpable sensitivity and precise language, Balistreri reaches "for distances not yet touched" and touches them. Contents of this website copyright © by Mary Jo Balistreri.